Can Saw Palmetto Prevent Hair Loss? What is saw palmetto and can it really prevent hair loss in men and women? If you're a avid researcher of hair loss products and treatments, then you'll have no doubt come across the North American plant extract, saw palmetto. It is believed, and claimed by many experts, that saw palmetto has the capacity to block the formation of DHT (the cause of hair loss), thus preventing hair fall and encouraging natural hair growth. So, how much of this is true? As part of our Hair Loss Awareness Month coverage, we look a little deeper into the functions of this fascinating plant. Saw palmetto is a small palm with fan-shaped leaves that have sharply toothed stalks, native to the south-eastern US. Saw palmetto's ripe fruit is used to make medicine, but this plant is best known for its use in decreasing symptoms of an enlarged prostate. According to many research studies, it is effective for this use. 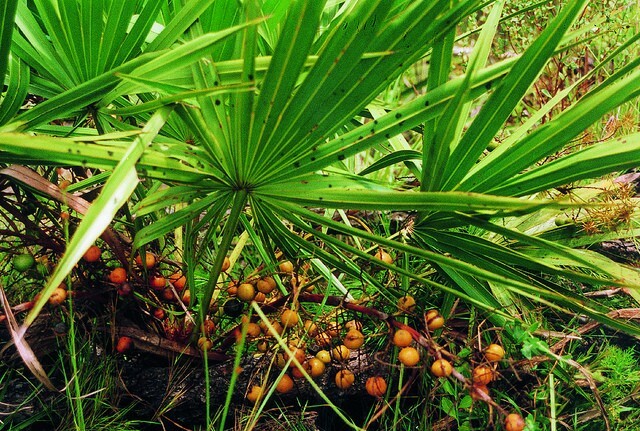 Saw palmetto is used for treating certain types of prostate infections. It is also sometimes used, in combination with other herbs, to treat prostate cancer. How is saw palmetto connected with hair loss? Although initial research and testing was for the purpose of prostate health, various studies showed that men and women experienced less hair fall during their trial period of using saw palmetto. So, much like the development of minoxidil as a hair growth treatment, saw palmetto was in fact discovered to help block DHT by total accident. There have been no official studies that have factually concluded this statement, but saw palmetto is used widely in many hair growth supplements and serums for the sole purpose of preventing hair loss. Male and female hair loss sufferers have gained positive results from using saw palmetto in an attempt to battle hair loss and thinning hair. Does saw palmetto have any side-effects? For the most part, saw palmetto is safe to take by men and women, although it should be noted that women should not take saw palmetto if they are pregnant or breastfeeding, as this plant acts as a hormone. Very mild side-effects can include stomach discomfort and slight headaches. The side-effects are not long-lasting. Many users make the common mistake of taking too much per day. A safe and effective daily dosage of saw palmetto would be around 250mg-350mg. How best to take saw palmetto? The most popular and safest way to take saw palmetto is through supplement form, which could be either tablet or capsule. Expect to pay in the region of £15-£20 for a bottle of saw palmetto supplement, but be sure to purchase one with a daily dosage of lower than 500mg. Many users will find it even more beneficial to take saw palmetto with other vitamins such as biotin, in order to help promote hair growth. Multi-vitamin hair health supplements like HR23+ and NUTRAFOL are excellent options to consider, as they use a range of ingredients that work to prevent hair fall and promote hair growth.